ALLERDALE RESULT:St Michael's - Mary Bainbridge, LAB, 1,304, Neil Schofield, LAB, 1,008. Billy Miskelly, LAB 948. Only Keswick and Seaton to go for the Allerdale Borough Council elections. 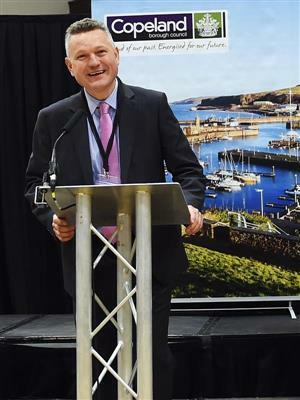 Graham Sunderland holds Arlecdon seat on Copeland Borough Council. Jim Lister said: "I'm very pleased to have been re-elected. I was disappointed with the controversy there's beenave been doing for the last caused [in relation to the recent application for a wind turbine on his farm] and I hope to be able to represent the whole of the community." Stephen Stoddart won his borough council seat after missing out by 82 votes in 2011. He said: "The main reason I put myself forward as a councillor for Moorclose was to help the children of Moorclose and Westfield. That's what I have been doing for the last four years. The people of the area have seen what I have been doing to help the kids and they have come forward and voted so I'm a happy chappy. "I want to continue to work for the benefit of the children. I want to get some serious investment back into Moorclose because when the leisure centre goes it's potentially just going to be an empty shell. The final four seats on Carlisle City Council have also now been declared. Unsurprisingly the Conservatives retained their seats in Irthington, Longtown & Rockcliffe, Lyne and Stanwix Rural. IRTHING: Lynn Bates (Green), 217; Cyril Bowman (Con) 761; Gerard Champney (Lab), 208. CON HOLD. LYNE: Ian Brewis (Green), 262; David Shepherd (Con) 917. CON HOLD. STANWIX RURAL: James Bainbridge (Con), 1,635; Christine Bowditch (Lab), 570; John Harding (Ukip), 371; Charmain McCutcheon (Green), 143. CON HOLD. It's looking likely that Allerdale will be a hung council, but we'll still waiting for two results.... Keswick and Seaton. ALLERDALE RESULT: Seaton - Mark Jenkinson, UKIP, 988. Joseph Sandwith, UKIP, 1,156. Celia Tibble, Labour, 1,022. ALLERDALE RESULT: Keswick - Tony Lywood, LAB, 1,041. Ronald Munby, CONS, 1139. Martin Pugmire, IND, 974.